The Nanaimo Boys and Girls Club of Nanaimo have been hit hard by a recent rash of thefts which is impacting their day to day activities. In the past two months, there have been 8 reported thefts from their Fifth St location. Most have involved gas being syphoned and gas lines cut on vehicles. Recently installed security cameras have also been tampered with or outright stolen. 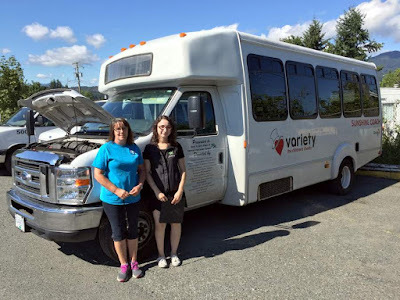 When gas lines are cut the vehicle requires a mechanical inspection which then puts the vehicle out of commission for several days, causing the cancellation of scheduled day trips for the kids. "We have tried locking gas caps, moving vehicles to more visible locations, installing flood lights and security cameras. None have had any measurable impact. These thefts have cost our program thousands of dollars", said Linda Janes, Area Coordinator for the Nanaimo Boys and Girls Club, shown standing on the left in the attached photo. Next to her is Jenna Erhart, Program Leader with the Boys and Girls Club. "It’s very hard on the kids when we have to explain to them their trip to the beach has been cancelled, yet again", said Erhart. If anyone has information on who is responsible for these thefts, contact the Nanaimo RCMP at 250-754-2345 or Crime Stoppers at www.nanaimocrimestoppers.com. text 274637, keyword Nanaimo or call 1-800-222-8477.